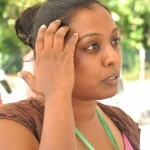 There are many knowledgeable consumers in Sri Lanka who don’t want their foods filled with pesticides or preservatives. Increasingly they are looking for healthy, natural foods and household products. They also want to “buy locally” and support rural communities. This is where The Good Market, a place for ethical producers and ethical consumers to team up, comes in. Explaining how all this started, Achala Samaradiwakara, Organiser, The Good Market says that through the Sewa Economic Development Company (where she functions as the National Coordinator) small businesses were encouraged and organic farming was promoted to farmers. The Good Market, a place for ethical producers and ethical consumers to team up. “Farmers, producer groups, and social enterprises throughout Sri Lanka have developed products that are good for our health, our communities, and our environment, but they often find it difficult to market these products domestically. We also wanted to eliminate the middlemen and The Good Market was a ‘good’ way to bring all this together,” Achala smiles, adding that Dr. Amanda Kiessel and she had initiated this programme. At the newly opened Diyatha Uyana market stalls next to the Parliament roundabout and Water’s Edge in Battaramulla, The Good Market stalls are in a beautiful recreational area that overlooks the Diyawanna Oya reservoir. Achala says during the past six months (this was started in December last year) The Good Market has become a place to meet friends, enjoy a family outing, and find a range of healthy, environmentally friendly, ethical products that are not readily available anywhere else in Sri Lanka. The market features “Poison-free” fruits and vegetables, Artisans, food and snacks, fair trade crafts, hand-made original art, natural health and beauty products, non-toxic home and garden products live entertainment and more. Ability Unlimited is a new stall operated by three organizations that benefit people with disabilities – National Council for the Deaf, DeafLink and Navajeevana Rehabilitation Tangalle, Achala says. They’ll feature organically grown farm products and handicrafts. The Good Market’s facebook page entices potential customers. “The Bread Company by Sovereign German Restaurant will have bread from traditional European recipes including rye, sourdough and whole wheat,” it says, adding that Panula, another outlet, has traditional Sri Lankan food with ingredients from their own organic farm. It also says that NEW Islander Organic has organic mangoes from the Islander farm and free-range village eggs this week. Butter Boutique, run by Rukshi Neththicumara is introducing healthy popsicles in two flavours – Mango Lassi and Passion Pineapple Coconut. They source all their fruit from local organic producers, according to The Good Market website. Milk & Honey Café is featuring Gluten-Free Fudgy Brownies and three vegan products -Carrot Cake, Choco-Banana Muffins, and Muesli Bars with Cacao Nibs. Craftshowk is introducing a new range of funky necklaces to match their up cycled rings. A selection of their fragrant Sri Lankan spice necklaces will also be available. Bake That Thing is offering a new flavour of homemade granola – Mocha and Cashew Nut. Cayambe Lanka has Eco Femme feminine products in addition to their natural andiroba insect repellent, face and body scrub, sea salt, air purifying plants, no-calorie stevia sweetener, and Gaia deodorant crystals. The English Cake Company has three new products. Their new sweet is a Raspberry Crème Brûlée Tart. Their savory is a Cherry Tomato, Leek, Caramelized Onion, Feta and Basil Quiche. They also have a new Gourmet Dark Chocolate and Orange Brownie. Achala says that there are currently 84 stalls at the site and each stall is 10 feet by 20 feet (approximately 6 metres by 9 metres) and each stall has shade and lighting. The current stalls do not have electrical outlets. A pedestrian-only path runs between the stalls. A vehicle access road behind the stalls makes stall set-up easy. 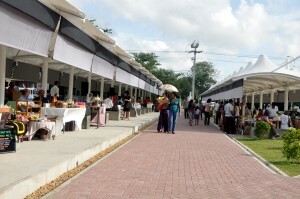 The Good Market is held every Thursday from 12 pm to 8 pm. The market hours will target the lunch-time crowd as well as the after-work crowd that already comes to the venue each evening. Live music may go until 10 pm. The venue is already very popular on weekday evenings, and The Good Market is expected to become a main event on the Colombo social calendar, Achala says, adding that the market will not officially close on rainy days. Local and foreign residents, tourists, and business travelers know that they can come to Battaramulla every Thursday for fresh natural food, weekly groceries, gifts, souvenirs, and specialty items. The Good Market is a curated event that highlights Sri Lankan products and services that are good for our health, our communities, and our environment. The organizing committee reviews vendor applications and prioritizes vendors based on Good Market principles and standards.